There was a "people's march" on Saturday. Their demands were incoherent. It was basically a whinge about Brexit. If it achieved anything at all it was simply to reignite the broader Brexit debate for a day or so where we find that views have barely changed on either side. EU funding might well fill a fleet of coaches for the Waitrose Whingers to go on a jolly but the last one did not dent opinion polls and this one won't either - and we are still leaving the EU. The flurry of debate, though, is not a renewed sense of urgency. Debate has been the usual displacement activity running in parallel to the negotiations where, as far as I can see, nobody really knows what is going on as we drink deeper from the well of absurdity. If anything the march has been something of an own goal in that it provides endless meme fodder for the leave camp. It's quite good fun having a poke at the distinctly middle class remoaner crowd. What we still do not see from the remainers is a reason to stay in the EU. As it happens, for all that I thought I would have much to catch up on after a week away there is little before me worthy of comment. 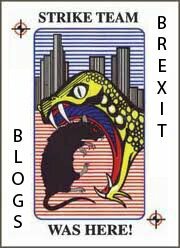 The Tories are still fighting like rats in a sack, remaonaers are still howling into their echo chambers, the ERG still don't have a viable plan, the media still adds nothing of value and Her Majesty's Opposition has gone AWOL and we are still left to guess whether there will be a deal and what form it will take. Here we see the usual crowd of brexitologists going over the same old ground and cycling through the same handful of vague concepts and still no closer to an agreed conclusion even among themselves. October was meant to be pivotal but still we drift ever closer toward the cliff edge, dithering our way to oblivion. All the while, were there the numbers to make a decisive move, parliament very well could step in to take charge but the factions are still fluid, each incapable fixing on a single idea. Still, the only man with a clue is Stephen Kinnock who must by now be suffering from the same Norway fatigue as me, having to go over old arguments and slapping down stupid questions. The only thing injecting a little colour into politics right now is the proliferation of the non-player character meme. A non-player character (NPC), also known as a non-playable character, is any character in a video game which is not controlled by a player. In video games, this usually means a character controlled by the computer via predetermined or responsive behaviour, but not necessarily true artificial intelligence. NPCs serve as a mode of delivering pieces of plot dialogue where there can be rudimentary interactions but any attempt to engage on matters outside the function of the NPC will result in repetition of standard phrases or trigger a behavioural error, often with comedic results. You can see how this analogy to certain political actors rapidly gathered traction as a meme. 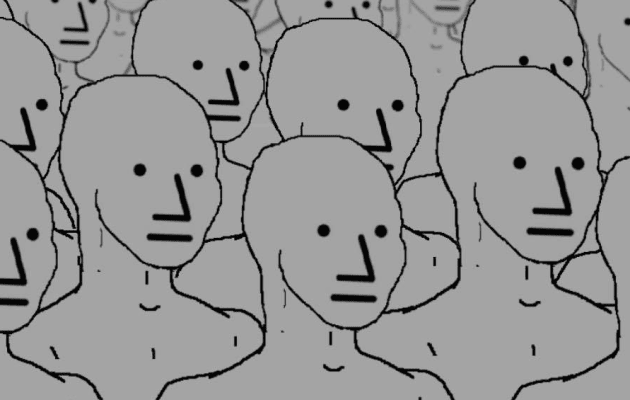 The Brexit debate certain has its own share of NPC's. Certainly when campaigning for the EEA I am met with the standard media programmed response of "But Norway adopts all the rules" or "but they still have freedom of movement" or "but that would require a customs union" or the especially annoying "but Norway still has customs checks". The respondent has a very limited script and is not capable of further dialogue so it will recycle these assertions, unable and unwilling to add new inputs into its dialogue subroutine. They actually display inferior learning ability to even rudimentary artificial intelligence. The point, though, is that the EEA is a treaty framework designed to be adapted for its member countries with institutions already devoted to managing what is an ongoing process of adaptation and evolution. We know the EEA is not the whole of the answer but it is the operating system that gets the show on the road and one that provides the most certainty for business. What we now find, with out future relationship looking indeterminate, it is far harder to roll over our external trade agreements. Were we maintaining the regulatory relationship, thereby maintaining single market participation, the balance of trade preferences stays about the same. Leaving the single market now puts us in the position of having to renegotiate all of those deals - which at this time is not where we wanted to be, not least since no new deals are likely to be signed until we know what the final status looks like. The Brexit NPC, however, has only one function which is to reinforce the narrative that Brexit is not deliverable and there are no solutions. The script, therefore, is designed as a blocking script and one that is by design not open to new inputs. It's highly effective too. The so-called off the shelf model is staying very much on the shelf. The point for me, though, is that the EEA is very much an adaptive framework where everything is negotiable just so long as you are in it. There exists enough legal tract and policy tools to plug the gaps, not least to forge an alternative to a customs union. Norway may not have the leverage to shape the EEA but Efta+UK most certainly does. What needs to be said, yet again though, is that the EEA is not an off the shelf solution. Since we are using computer analogies, the EEA should be looked at as an operating system whereby the install process has to be run on the host hardware. One cannot simply copy and paste the files from one computer to another. The drivers need to be configured for the hardware and personalised for the user. As has been pointed out the EEA does not cover agriculture and fisheries, which though on the face of it is a selling point, the UK still needs protocols to cover that which is not covered by the EEA even if only as temporary arrangements. As much as this could take a number of years to negotiate, the new protocols would likely take a while longer to implement. To then suggest, as Nick Boles does, that we can hop into the EEA and then out after three to five years, spectacularly underestimates the scale of the task. This is the plan now known as "Norway then Canada". The obvious point here being that Canada is still subject to standard third country controls and is excluded from a number of sectors with minimal services access so we have to ask what would such an approach achieve that the existing transition does not, and if all we are doing is postponing the cliff edge, what is the point - and why would Efta be amenable to the disruption? Of course we will not get answers from the likes of Boles and Freeman. What they have sounds superficially plausible and on the face of it seems like a compromise but it is still essentially a hard Brexit and one which still ducks all of the complex questions. Methinks the plan is more to do with appearances than actually addressing the issues. If the UK is going to join Efta then it needs to do so as a willing an enthusiastic long term member, rather than grudgingly and with no intention of contributing to its development. Essentially, to pull off an EEA Brexit, it would require a certain guile and skill that simply isn't there. Much would have to be negotiated and there would have to be a much bolder vision than simply parking Brexit. We have to think of Efta in terms of how we build on it and how we make it an instrument of influence globally. This we are not doing though. Mrs May is embarked on a managerial administrative process looking for technical solutions as a system patch. This is where Brexit is let down by its absence of vision. The closest thing the ERG have to a vision is fantasy based on dilapidated free trade theories - all of which have taken a pasting from actual trade professionals. We are now engaged in a propaganda game where any free trade deal, no matter how threadbare, will be hailed as evidence of the UK flexing its muscles globally. This, though, is not a vision. It is a delusion. Any vision necessarily requires that we take into account the constraints and realities of modern trade which the ERG, by their own admission, do no such thing. Their recent paper on transatlantic trade was more a "what if" than "what is". There exists the view that the UK only needs an FTA with the EU and that seals the lid on UK-EU relations - absolutely disregarding the need for enhanced intergovernmental relations beyond commerce in the future. Thanks to the intransigence of the Brexit ultras we are now in the last chance saloon. Odds of securing a withdrawal agreement now rest on the toss of a coin. The UK is once again shifting the goalposts on the Northern Ireland backstop, where again the EU has reiterated that there is no deal without a backstop. They may yet agree to a fudge if only to secure a longer transition so that they can make firmer preparations. From what I saw at Calais last week, they do not have much yet in the works and very little space to respond to a fundamental change of operations. What we can now be assured of is that, having ruled out the one workable Brexit, we are left with an unholy mess. Either a no deal Brexit or a patchwork of agreements all of which are on the EU's terms. The economic impact of Brexit will be more than it ever should have been and will take far longer to recover from. Brexit needed substantially more talent than our think tank policy apparatus can provide. "We can get a better deal than Norway" they said. Of itself, though, that is not a reason to stop Brexit. Though the Waitrose Whingers hold their jamborees in London, the Brexit voters in the northern towns are not so vocal. As far as they see it, there was a referendum, we voted to leave and they expect it to be delivered. If there lacks the talent to do it well that is really only an affirmation of the overall sentiment of Brexit. As much as anything the referendum was an opinion poll on the establishment and the verdict was that it was failing us. Nothing we have seen since would suggest the voters were wrong.